If President Obama is counting on a new wave of popular support to help push stricter gun laws through Congress -- as he said he was on Sunday -- then he might want to take a closer look at the latest opinion polls. While the public is more amenable to new gun laws than it was before the shooting in Newtown, Connecticut, there hasn't been a fundamental shift in its attitudes toward gun rights and specific gun-control laws. Perhaps more importantly, the Republican rank and file remain opposed to new gun-control measures, making it tough for even modest new gun laws to pass the House. While other mass shootings since Columbine haven't moved the polls on gun control, the massacre in Newtown did leave a noticeable imprint on public opinion. The four post-Sandy Hook polls show a majority of Americans supporting stricter but unspecified gun laws, up from the mid-forties after the July shooting in Aurora, Colorado. Even so, the public remains divided on the broader question, with only a plurality of Americans preferring gun control to gun rights. With only a tenuous majority that believing that gun control should trump gun rights, the coalition for stricter gun laws will have to include voters who support gun rights. This coalition supports modest gun-control proposals, like background checks and banning high-capacity magazines—the latter of which receives 53 and 62 percent support in Pew Research and USA Today/Gallup surveys, respectively. The coalition fractures, however, on the issue of an assault-weapons ban. USA Today/Gallup and Pew Research surveys show that just 44 percent support banning semi-automatic rifles, while only an ABC/Washington Post poll shows majority support. The public is overwhelmingly opposed to more ambitious proposals, like a ban on hand guns. In each instance, public support for these proposals remained near pre-Newtown levels, even though many voters flipped on the general case for new gun control laws. It's possible that public support for gun control will increase further, and there are signs that the sustained debate over gun control since Newtown has resulted in an additional increase in public support for new gun control laws, even beyond the initial post-Sandy Hook bump. For instance, a HuffPo/YouGov survey conducted immediately after Sandy Hook found that 50 percent supported stricter gun laws, but that increased to 55 percent one week later. That might not be especially surprising given that the public gun control debate was relatively one-sided after Newtown--and that gun-rights advocates, like the NRA, appeared to misstep once they entered the fray. If gun control advocates continue to press their case and the media remains focused on the issue, then it might be possible to squeeze out additional public support. After all, support for gun control laws was higher a decade ago, especially after Columbine. On the other hand, public support for new gun control measures could begin to fade if the gun issue falls to the back-burner; the post-Columbine gun control bump faded quickly. But additional increases in public support for new gun control measures would require additional gains among Republican-leaners, who remain relatively unified against gun control. Just 29 and 38 percent of Republicans support stricter gun laws according to ABC/Washington Post and CBS News polls, respectively. Pew Research found that just 27 percent of Republicans think gun control should take precedence over gun rights, up from 26 percent prior to Newtown. Presumably, there is even less Republican support for more specific measures, like an assault weapons ban. It's unclear, then, how any such measures squeeze through the GOP-controlled House. Many House Republicans have more to fear from a conservative primary challenger than a Democrat in their safely Republican districts. If House Republicans are most responsive to the opinion of Republican primary voters, then the broader shift in public opinion is unlikely to change the minds of members of Congress from conservative districts. Between the public's relative skepticism of specific gun-control proposals and continued Republican opposition, public opinion might not be a game changing asset for gun control supporters. 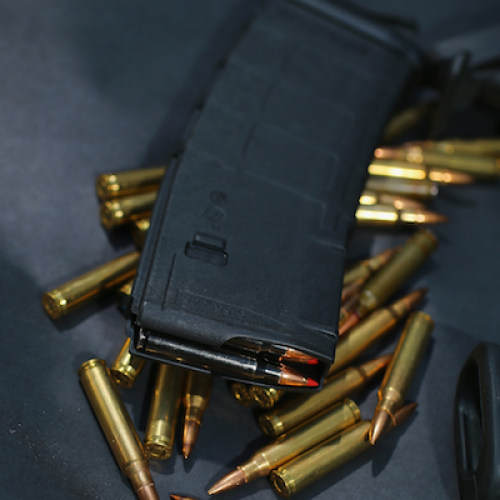 Republican action on high-capacity magazines and other limited gun control measures would need to come from, of all places, lawmakers reassessing the merits of a policy. That's not impossible; a few NRA-backed Republicans have indicated their willingness to reassess gun laws after Newtown, and probably not because of public pressure. But if House Republicans are as beholden to the conservative base as is generally assumed, then Republican defections on gun control would be rare. Edited 1/3: "high-capacity magazines" replaces "high-capacity cartridges"